The South African Mint is one of the oldest mints in the world. As an agency of the South African state, its primary role is to mint the country’s money, but it also mints numismatic products, including the world-renowned investment coin, the Gold Krugerrand. The South African Mint was created in 1892, shortly after the discovery of gold deposits in South Africa’s soil. Then-president Paul Kruger decided to create the mint so the country could issue its own money and be more autonomous. The refinery’s status changed in the 1980s and it is now considered as a subsidiary of the South African central bank (SARB). The South African Mint has two divisions, one for circulating coins (CC) and one for numismatic coins (Nums). The CC division mints not only South African coins, but also coins used in several countries in Africa, Asia, Europe and South America. The Nums division produces high-end quality products, mainly gold and silver, specifically for the collectibles market. In the philosophy of the South African Mint, its coins are destined to last a very long time, and the coins it produces today will become tomorrow’s treasures – timeless pieces. The South African Mint’s values are: Integrity, Creativity, Ubuntu, Conservation and Mastership. The South African Mint is renowned worldwide for its attractive designs, exceptional expertise and the high level of quality in its gold bullion. 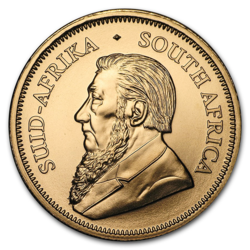 In addition to minting all the coins in circulation in South Africa, the South African Mint also issues series of coins for investment purposes, such as the Natura Series, the Protea Series, and the Krugerrand. The Krugerrand was the first modern gold coin to be issued by a government, and it is now one of the best-selling coins on the market. All their collection series are produced in a variety of denominations: 1 ounce, half-ounce, quarter-ounce and 1/10oz. Over the past few years, the South African Mint has minted new products, notably series of silver coins that, in the future, could become references for collectors. The mint also offers commemorative coins for historical events, such as the passing of Nelson Mandela. The South African Mint operates a museum and store within its plant and authorizes educational visits at its production site. It also offers commemorative coin services to foreign institutional clients. These coins are produced by a state organism which, in itself, is an important indicator of quality. The South African Mint has received several national accreditations (such as ISO 9001) that guarantee a high level of professionalism in the production processes. Other accreditations, such as OHSAS 18001 and ISO 1400, are awarded for the respect of international quality standards. The mint has put in place a variety of systems in order to fulfill its environmental obligations and to contribute to sustainable development. Its ISO 14001 accreditation is presently pending.